It’s Guillaume for another classic conference post-mortem! This was easily the best conference we’ve been to, so hopefully my enthusiasm comes across in the excess of exclamation points! If you’ve been following Tablecraft awhile, then you probably remember that we’ve been trying to fund the early development of the game through an SBIR Grant. In particular, you may remember Edward Metz from the Games for Change 2018 postmortem. 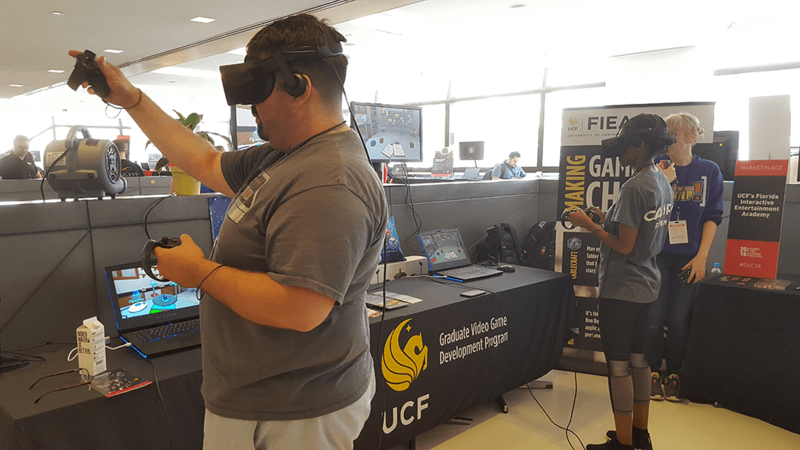 Well, the ED Games Expo is his baby, and it’s all about showing off the education games funded by the SBIR program, which he directs for the Institute of Education Sciences. 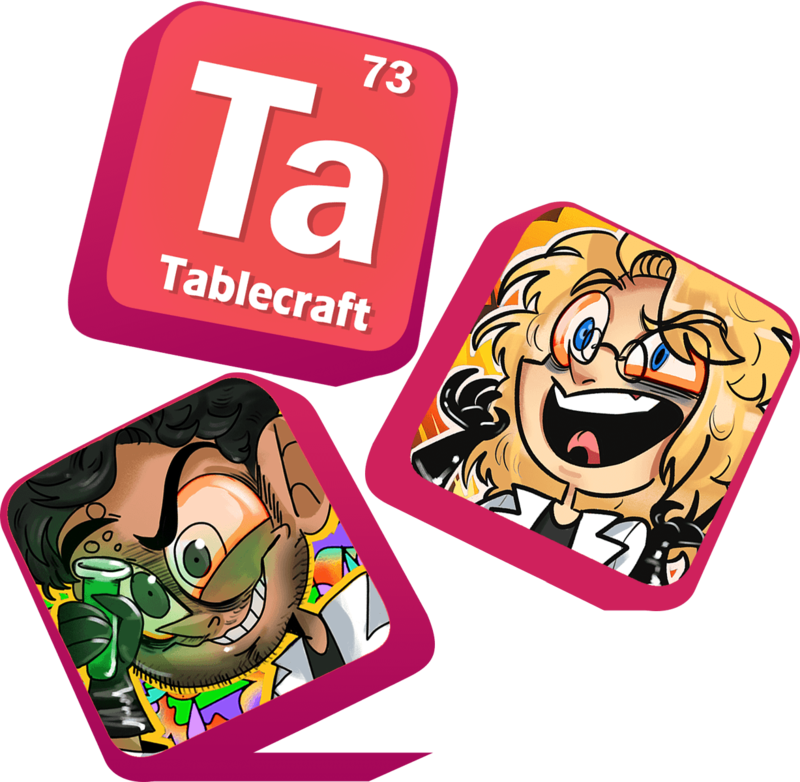 Everyone there was pretty much a hero of ours, since Tablecraft was one of the few invited games that didn’t already have a grant, and the conference exists to promote the best work that comes through the system. So you can understand how big a deal this was, our VR station was between NASA and MIT on the VR booth chart. But, it wasn’t just cool because there were so many exhibitors we admired there – this conference was special because of its attendees. 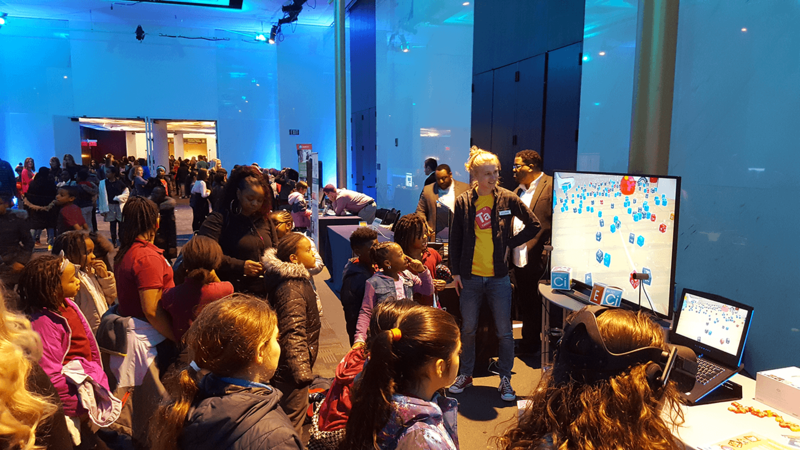 We had barely finished setting up our booth in the morning of the first day when 1200 kids stormed into the conference hall excited to play the games there over the course of 4 short hours. Even with 2 VR stations, Tablecraft became permanently, hilariously swamped with players waiting in line for a chance to try the game. Here’s a picture that we took. 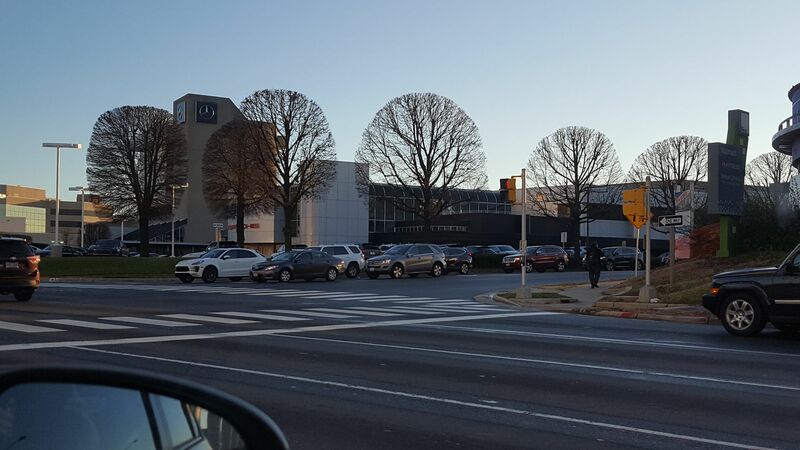 Look at all those kids! Pictured here: me trying not to be trampled while explaining the game. I didn’t know about this until after the 4 hours were over, since we barely got to talk to each other during the maelstrom, but apparently several of the kids from Rafael’s line ran over to my “line” after playing Tablecraft, and pretended they’d never played the game at all so they could have a second turn! 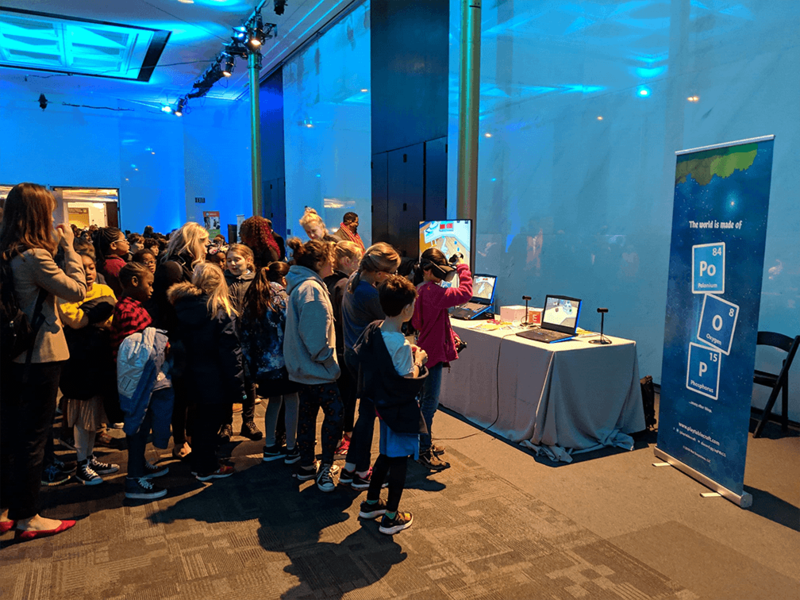 After the kidstorm, there was what the conference called “Office Hours”, where booths for consulting companies, government agencies, and venture capital firms (collectively known as stakeholders) were set up for developers like us to check out. It was basically like the conference flipped upside down for the afternoon. At the start, we each ate half of the world’s biggest sandwich, and I gave a few demos with my mouth full to other developers. Then we walked around to talk to all the organizations we could find that seemed relevant to Tablecraft as a STEM-related game. Even by the start of the Office Hours we were already exhausted, but around the end of the day Ed told us that word of Tablecraft’s popularity had spread from the terrace of the Kennedy Center all the way down to the first floor of the building, which helped us stay excited long enough to make it home and into bed alive! The second, and last day of the conference began with a couple panels, from developers, scientists, and stakeholders respectively. 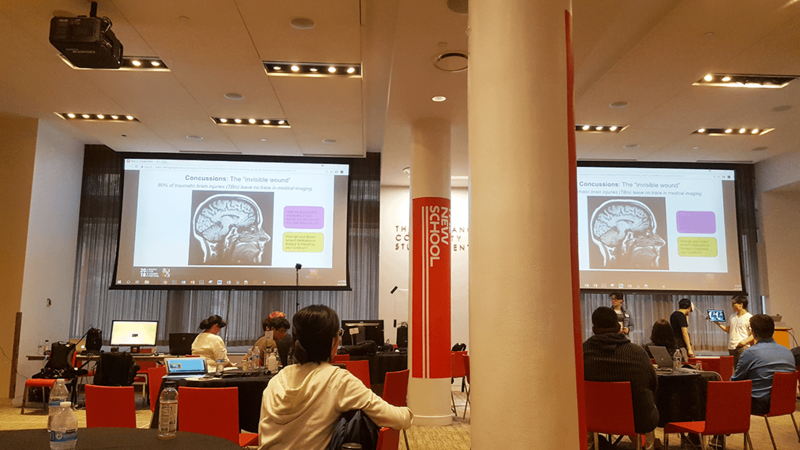 I was particularly into the learning scientists’ panel, because as a game developer trying to make an educational game, proving that it teaches useful skills is a new and difficult challenge. The panel was very easy to understand, which in my opinion is how you know scientists are really good, since not leaning on jargon requires particularly clear knowledge. They also talked about some education science resources for game developers that I didn’t know about, my favorite of which was named NERD. The last official bit of conference was the public showcase. I got to have some of my family play the game, which was great. Plus, a lot of cool people we hadn’t yet met got to see or try Tablecraft, including a representative from Oculus, a charismatic man who really wanted me to know his son was looking for a job, and a dad who had to argue with his kid who didn’t want to stop playing so the dad could get a turn playing the game. Overall, though, the public showcase, and the entire second day of the conference, was really quite relaxing compared to the kidnado. Adults don’t always understand VR controls the way kids do, and they’re less good at having fun (sorry adults! ), but they stand in a queue! If the previous day was a fun company trip to splash mountain, the second day was more like company poker at the hotel pool. Higher stakes, but it was nice to be breathing in between sentences. The last, unofficial part of the conference was dinner at an AMAZING restaurant called Farmers, Fishers, and Bakers. We got a bit lost walking over to it, but Ed Metz actually saved us a spot, which was super nice! At dinner, we enjoyed the company of some of our fellow developers as well as Ed’s, as he shared with us the story of how the expo came to be and what drives him to keep it going. 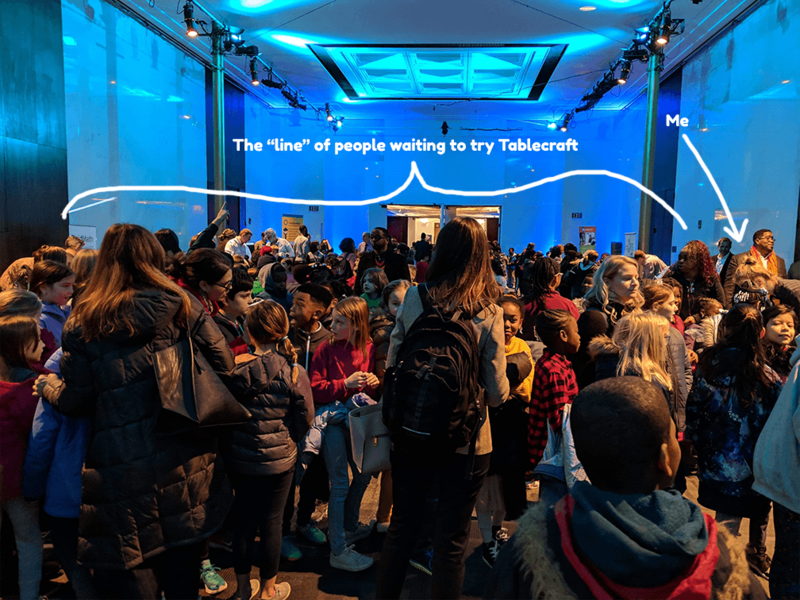 The whole conference was only two days long, but we probably got to meet more kids, parents, and educators who were excited about Tablecraft than we have at any other. Thank you for having us, we’d love to be there again next year! Guillaume back with a second conference post-mortem! 😉 As you might recall, our last outing was to GDC, a huge big-money games-industry conference where the best we could do was focus on finding a few like-minded folks. 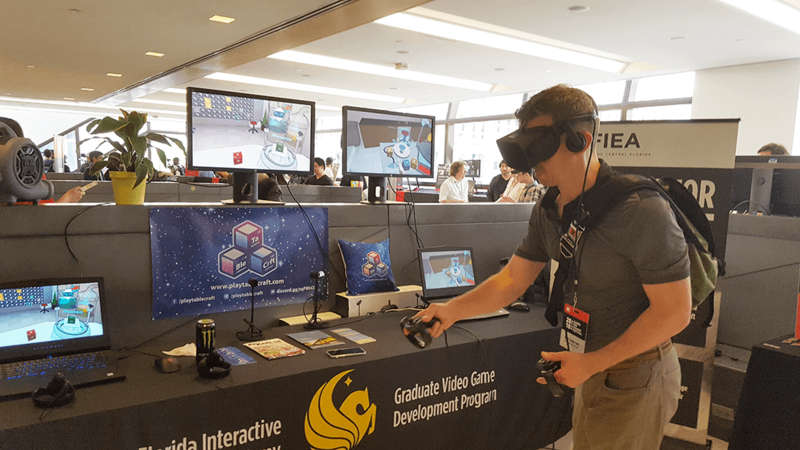 By contrast, Games For Change (G4C) was entirely people who were passionate about games using new technology and covering meaningful subject matters, like we’re trying to do, so we were pretty excited about it. This time we had a booth, and we could not wait to see other people play the game! The stars were aligned for everything to go right, but then bad luck came along, launching us to a rocky start before we turned it around and pulled off a smooth and exciting landing at the end of the show. 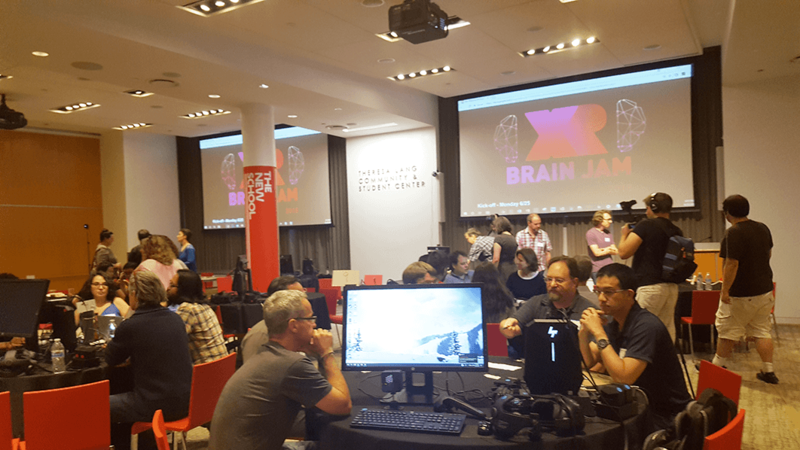 G4C has an affiliated neuroscience game jam which takes place before it – the XR Brain Jam – and we’d signed up to participate when we bought our plane tickets. We were excited to arrive early in NYC and get to meet many of the G4C attendees at the game jam before the actual conference started later in the week. Except, as it turns out, the jam was already full. So now with a couple of extra days of free time in NYC, we signed up for the jam as volunteers and decided to infiltrate the premises that way. It wasn’t quite the same privileged position as being part of the jam itself, but it wasn’t all that bad either: we got to meet everyone still, except now instead of contributing with our expertise on game development, we’d have to contribute with our expertise on carrying things. We didn’t really look like the high-schoolers who were working alongside us to carry boxes and set up VR kits, which probably explains why we were sent on all the alcohol-pickup missions. When we had downtime, we’d watch the proceedings at the jam, and learn about the people participating, to see who we’d want to meet at the event proper. 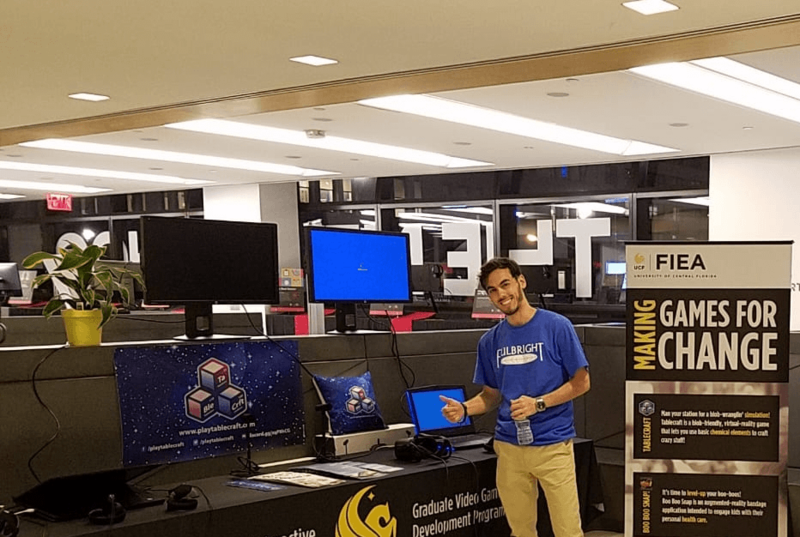 Plus, we worked on Tablecraft, in a spot where we could help people find the bathroom, which was the G4C edition of our classic conference hack, Working by the Outlets. On Day 2 of the 3-day jam, we were the only ones to arrive on time at 8 am! After we set up breakfast for everyone, we sat at a table, working on getting Tablecraft’s AI assistant to move around when she talks to you. The Working by the Outlets hack paid off that very morning. 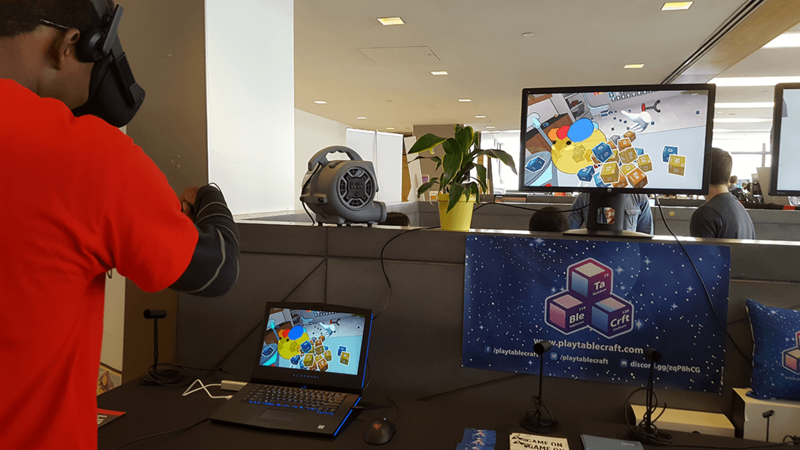 One of the organizers of the jam, Sabrina Culyba – designer of Schell Games’ Hololab Champions – invited us to work in the jam space, and asked to play our demo! 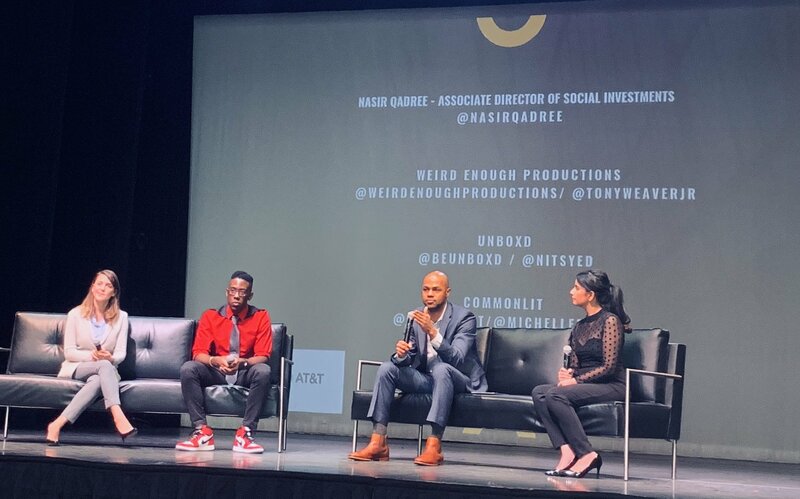 At this point, the conference was going great, and we were making a positive name for ourselves. Then, I suddenly fell very sick. At around 10 am, I developed a sudden fever, and asked to sleep in the volunteer office for an hour or so. Then, I tried to get back to work – we wanted to polish up a couple last details on our demo before we showed it to Sabrina! I was still shaking, though, and the volunteer organizers soon grew concerned that I would get others sick. 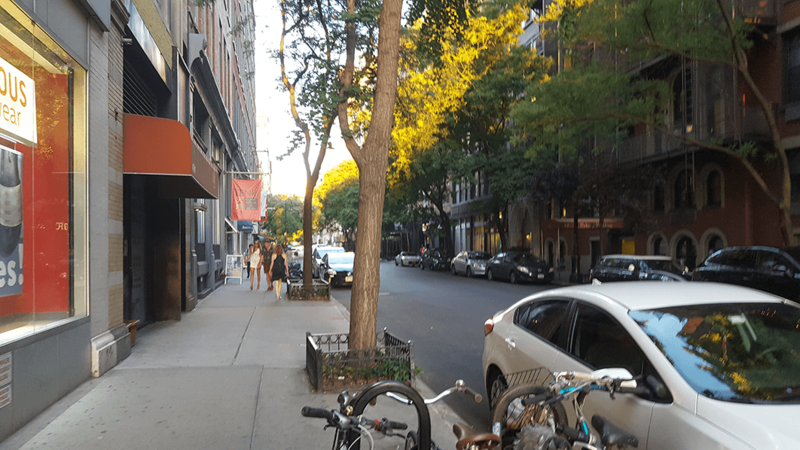 I tried my best to stay upright and work out of the way, so as not to make anyone uncomfortable, but in the end we were kicked right out to the NYC streets, where Rafa and I walked 45 minutes back to our AirBnB. We were feeling pretty sad, since our first opportunity seemed to be drifting away, but there was nothing to do but go home and get rest. On the 3rd day of the game jam, my fever was gone, which was strange. We took it as reason enough to get back to work, and put in some time with the volunteers to make up for the previous day. Then, we found Sabrina and offered her a demo. 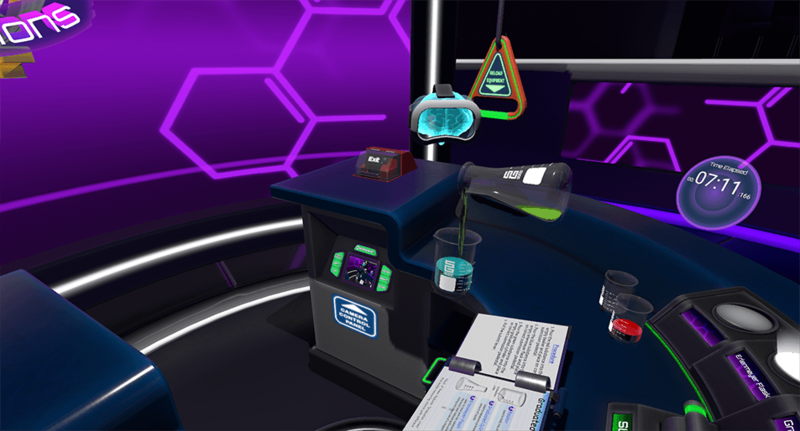 Her husband Dave, of Carnegie-Mellon, also played the game, and she gave us a huge amount of information on how she had tackled problems in her own VR chemistry game, some of which we had in common. She could have treated us as competition, but instead we had a big group conversation about making chemistry work in VR. To me that was a highlight of the conference, and indicative of the unified passion of its attendees. Over the course of the conference, Rafael and I saw Sabrina and Dave many times, and they became our preferred familiar faces to search for in a given crowd, because we had so much in common. From a business side, we had come to the conference to try to fund the remainder of Tablecraft’s development. 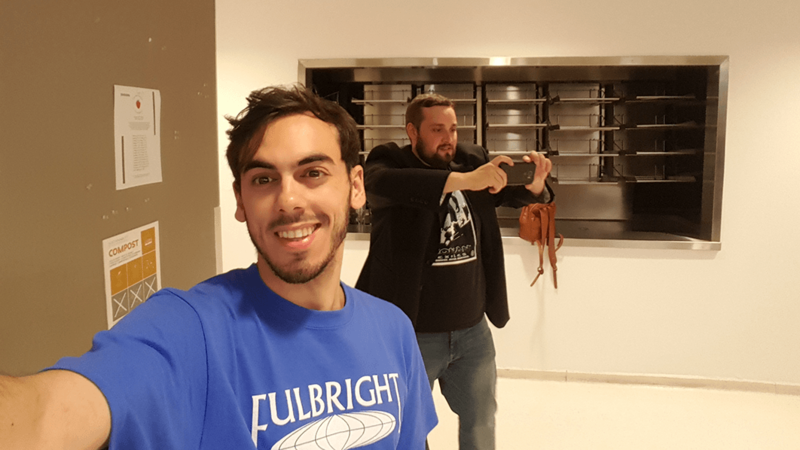 Because of Rafa’s Fulbright VISA status, we needed either a partner, who could apply with us for a government grant called the SBIR, or a publisher, who could pay us in advance of Tablecraft’s release, and then support distributing it. I think our strategy for finding this stuff worked pretty well: we let other people bring it up. Instead, we focused on just showing people the game! On the 3rd and last day of the jam, Sabrina mentioned that we should show Tablecraft to Jesse, the CEO of Schell Games, and so that became our new quest. The night of the end of the game jam, I developed a terrible headache, which then centered on my right ear. The next morning, my eardrum had ruptured. I went to an urgent care center, and it turned out my odd 1-day fever had been caused by a middle ear infection. I got antibiotics and pain medication, and was told it would heal over time. I also couldn’t hear a thing with my right ear. Enthusiastic group design sessions like the one we’d had with Dave and Sabrina were going to be a thing of the past for this conference. At best, I’d have to engage with whoever was to my direct left. But the next day, things started to look up! 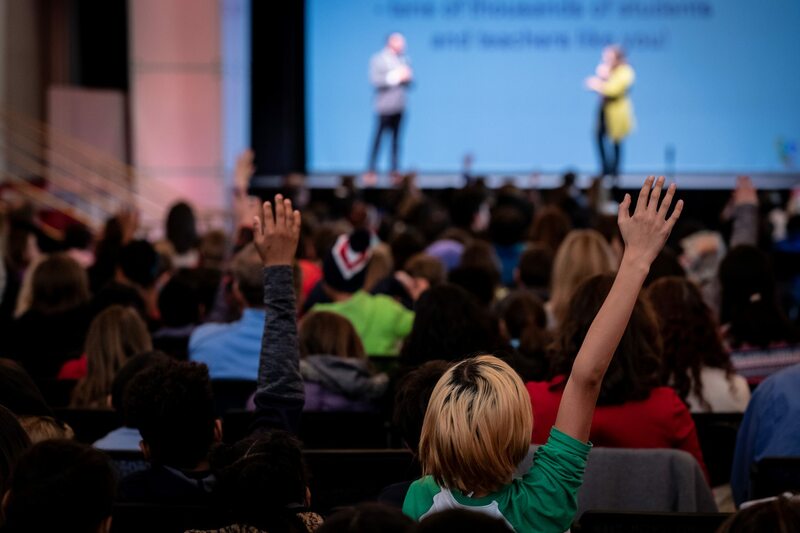 On the first day of the actual conference, we were immediately the most popular kids in school. It was glorious. 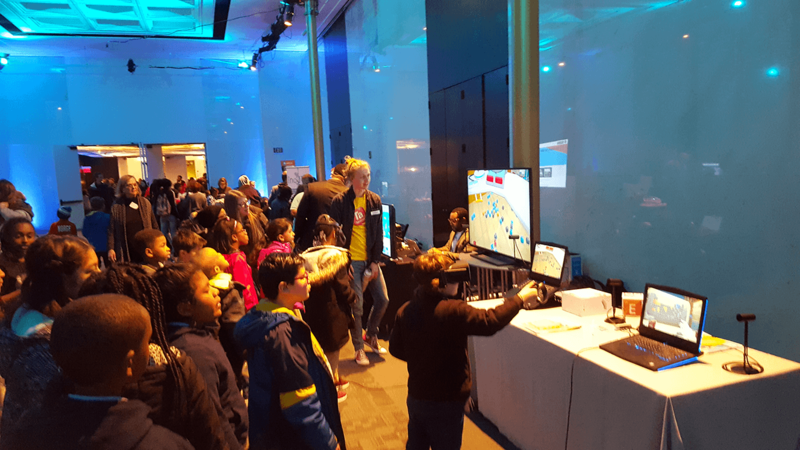 We’d lugged 2 Oculus Rifts to New York City, and scrambled to improve our booth with a large monitor for each. At the day’s start, with our laptops on the table and our monitors on the wall, we had 4 colorful videos of Tablecraft bouncing around on 4 displays, with a sleek black tablecloth holding the waiting headsets. The whole thing was facing the main entry to the convention hall — it reminded me of a bank of arcade attract screens. Sharing the space with us were our good friends James Gaiser and Sound Wright, showcasing their sleek augmented-reality app Boo Boo Snap! James was kind enough to help us out with a place to stay in NYC after our AirBnB expired, and both him and Sound were a constant source of positive energy at the booth! Pretty soon we had a constant flow of interested parties, with at least 1 demo active at all times in the day. I tried to give the demo on the screen to the right, since I could stand with the player to my left and hear what was going on. In general, we were pretty hands-on with the demos too, guiding players toward each machine as needed, since the game doesn’t quite explain itself entirely just yet. It was a long day, reintroducing the various parts of the game in rapid succession, but it was extremely rewarding, because so many people with different levels of experience and areas of interest gave it a real go. Many were game designers or educators, and gave us useful, clear feedback. And most of all, the game REALLY hooked a few people. Bill Sabram was our Tablecraft prodigy. He started his design career on electronic toys, and like many of the other game designers who tried it, he was bursting with ideas. Bill had a secret strategy for winning our hearts, though: he just could not stop playing! At one point, a media crew bristling with cameras and microphones swung into the booth, as they made the rounds through the whole conference. Bill was completely unphased as they interviewed the projects next to ours, and at one point he got the whole camera crew laughing by sticking his nose unknowingly in the reporter’s back. Bill had been playing for more than an hour, and he’d forgotten what we looked like when the reporter put a microphone to his mouth and asked him about the game. Then and there he gave a better pitch than we’d ever delivered ourselves, focused on how he was so engaged with what set each element apart. On the last day of G4C things started to really pop off. 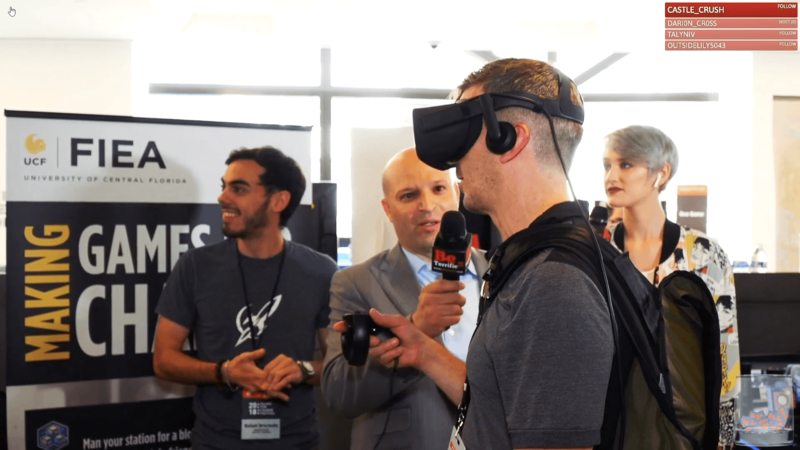 The momentum we’d built talking to individuals meant the project was relatively known, and a few of the conference heavyweights were out and about. Jesse Schell and Harley Baldwin of Schell games came over to the booth to play Tablecraft, with Jesse inquiring us about our business strategy and Harley offering valuable input on the game’s design. But on that day, in New York City, the friendliest, majorest leaguer of all was Edward Metz, Director of the Institute of Education Sciences’ SBIR grant program. 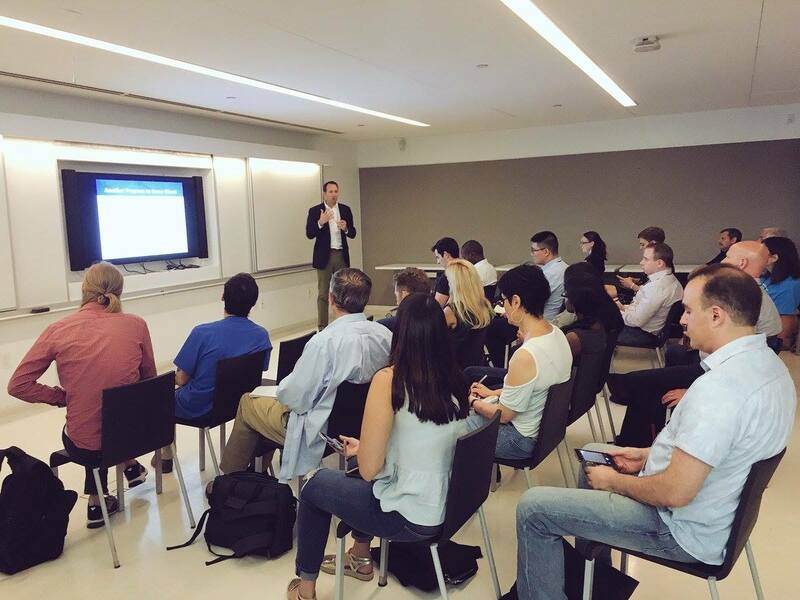 We first got to meet Ed at an event called Meet the Funders, where he gave a short talk about all the requirements of the SBIR grant, and answered questions. Ours was a popular one — how does Rafael’s visa status affect our chance at the grant? It turned out at least 4 people in the event were foreign citizens interested in the grant as well! The thing that stood out to me at the talk was how Ed thought everyone in the field was making something worth making, and all they needed help with was making it real. To me, it headed off any hint of competitiveness or rancor in the room. Apparently the guy helps over 300 different people per year with navigating the bureaucratic maze, and it’s clearly because he genuinely wants more education technology to exist.